It is with great sadness that we share with you the news that former faculty member Joanne Beach, who spent 37 years at the school as a teacher, administrator and alumni liaison, died November 6 at the age of 73 after a years-long battle with Amyloidosis. 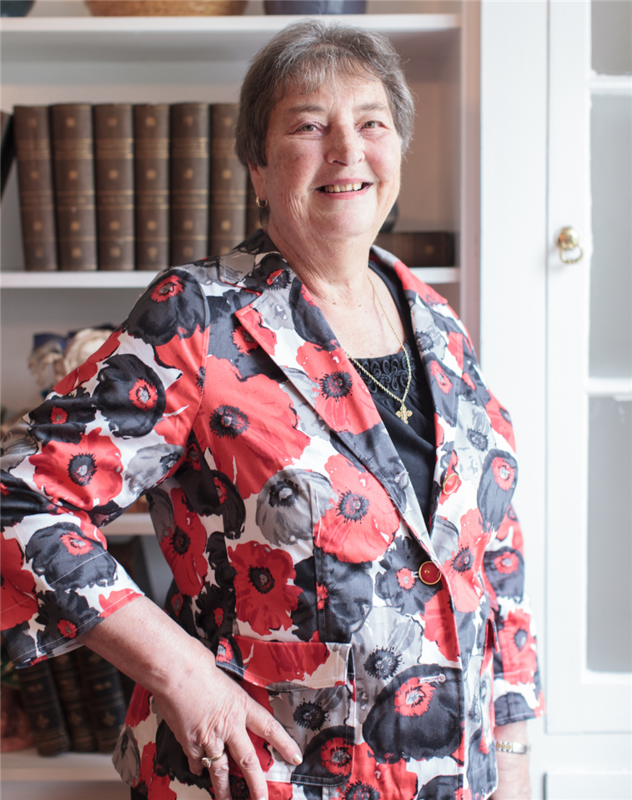 Joanne, who was St. Andrew’s first science teacher when its doors opened in 1978, was the soul of St. Andrew's, shaping the supportive, student-centered, loving culture that we continue to cherish today. A native of Mercerville, N.J. and a graduate of Western Maryland College, she taught science in Baltimore public high schools right out of college before taking a break to raise her two sons, Mike (St. Andrew’s Class of 1988) and Pete. When it was time to return to the workforce, she began looking for a new teaching position. She saw a Washington Post classified ad seeking a science teacher for a new school, interviewed the following day, and was offered a contract on the spot by founding headmaster Jess Borg. While teaching science for three years, she saw the school’s enrollment nearly quadruple, leading her to take on the role of Director of Student Activities. Later, she became Dean of Students and, beginning with the 2000-2001 school year, she became Head of Upper School. She remained head of the division until she semi-retired after the 2011-2012 school year when she became the school’s first alumni liaison. In 2015, the school’s front circle was renamed the Joanne Beach Circle. During her nearly four decades at St. Andrew’s, Joanne, who was well-known for being moved to tears at the drop of a hat, touched the lives of thousands of students and their families. In 2012, when it was announced that Beach was semi-retiring, alumni were given the opportunity to share stories about her. Susan Howard, a member of the school’s first graduating class in 1982, recalled that her class’s yearbook was dedicated to Ms. Beach. Sarah Hulen Eckard, also a member of the first graduating class, had a similar recollection. “Her warmth, wisdom and sense of humor came through in the classroom, and from there her special relationship with our class just naturally grew over several years,” Eckard said. Beach also had a similar impact on her colleagues. Beach is survived by her children, Mike and Pete, their wives, Katie and Terri, respectively, and her grandchildren, Ryan, Olivia, Kasey and Evan. Fittingly, during today’s All Saints’ Eucharist, Joanne was remembered by name among the saints from our St. Andrew’s community who have died this past year. In keeping with Joanne's wishes, her memorial service will be held here at St. Andrew’s on Sunday, November 18 at 1 p.m. Click here for details on the event.